Badam Milk Powder is a flavorful mix of dried nuts and sugar which is added to milk. This powder is simple and very hard to go wrong. All you need to do is grind them together and store. * I used rock sugar (kallu sakkare in kannada). Measure all the dried nuts and sugar mentioned under 'Ingredients'. Now grind all of them together in a dry mixer until you get a fine powder (if your jar cannot hold all of them at one go then, grind them in batches. Make sure each batch contains sugar. Without sugar you get a sticky mass because of the oil released from the dried nuts). Badam Milk powder is ready!! Store it in a dry air tight container. It stays good for 3-4 months. How to use: Add this powder (1 Tbsp) to a glass of hot or cold milk. Add additional sugar, if desired. Mix and serve. This powder can also be used in vermicelli payasam or any other milk based dessert. Take oats, rice flour, baking soda and salt in a bowl. Then add yogurt and mix well. Then slowly add water to make it a thick batter (oats will soak up little moisture. Yogurt I used was really thick. Hence I ended using 1 cup of water). Let this batter rest for 10- 15 minutes. While the batter is resting, prepare the seasoning. Heat oil in a small pan. Then add mustard seeds. When it starts to splutter, add chopped green chillies and curry leaves. Then add in chanadal and roast for few seconds. Then add in the chopped onions and roast this mixture until the onions starts to turn brown. Add this seasoning to the batter. Mix well. Add more water to the batter, if it is very thick (consistency of the batter should be thick but of pouring consistency). Fry the other side until you get a uniform color throughout. Remove them and serve. Masala Oats Appo is ready!! Serve it hot with any chutney of your choice. Above measurement serves two people. Pancharatna Dosa is a newly tried recipe. I got this recipe from a FB food group, long time back. But I never got a chance to try it. Finally I tried it and it turned out really good. Do try making this simple dosa. It comes out very crispy. Wash and soak rice, 4 types of dal (mentioned above) and methi seeds in water for 3-4 hours. Drain the water and grind it to get a smooth batter. Add water as required. The batter should be thick. Ferment it for 8-10 hours. Then add salt as required. Adjust the consistency of the batter by adding water. It should be thick but of dropping consistency. Batter is ready. Serve it hot with chutney. Above measure serves 2-3 people. Karathe Nonche is a popular Konkani dish. In konkani, karathe means bitter gourd (bitter melon) and nonche means pickle. I got this recipe from my mother. Wash bitter gourd. Chop off the ends and then cut it open to remove the seeds. Then chop it into small cubes. Then put the chopped bitter gourd in a bowl and add salt to it. Keep it for half an hour. After half an hour, squeeze out the extra moisture (bitterness) from the bitter gourd pieces and then keep it aside. Now roast the dry red chillies with few drops of oil until it changes its color slightly. Then transfer it to a plate. Now in the same pan start roasting the mustard seeds and fenugreek seeds until a nice aroma is got. Then turn off the heat and add asafoetida and turmeric powder immediately. Mix well and fry for few seconds. Then transfer it onto a plate/ bowl and allow it to cool. 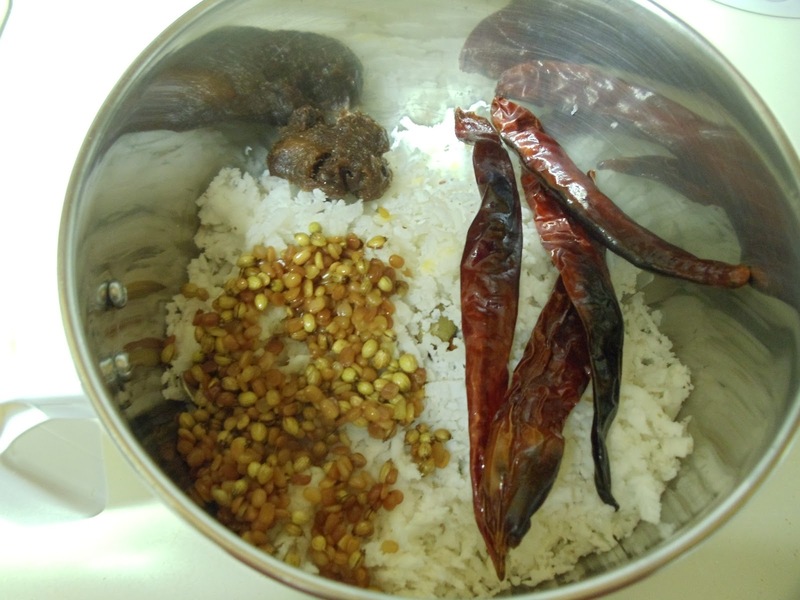 Now grind the roasted spices along with tamarind to get a fine powder. Then add few tablespoons of water, so as to get a fine paste. Set it aside. Now start heating water in a small pot, just enough to cook the bitter gourd pieces. When it comes to a boil, add in the prepared bitter gourd cubes and allow it to cook for 8-10 minutes, on a medium flame. Once the bitter gourd pieces are soft (not mushy), add the ground masala, jaggery and salt. Mix well. Adjust the consistency of the pickle by adding water (I kept it medium thick). At this point taste it and check if salt/ tamarind/ jaggery is required. Allow it to boil for 3-4 minutes. Then turn off the heat and then add the seasoning. Note: You can also add chopped bamboo shoots (canned or brined) along with bitter gourd pieces. It adds a wonderful flavor and crunch to the pickle. Benda Chakko is a popular konkani dish. The okras are cooked in a coconut based masala resulting in a very yummy dish. This dish is little bit on the dry side and makes a good accompaniment to rice. I got introduced to this recently from my SIL. Till then I thought it can be made only using raw jackfruit. This is specially made using overgrown (hard) okras. Try making this simple yet delicious curry. I am sure you will love it. Wash okra and pat dry it completely using a cloth or paper towel. Then trim off its ends. Then cut them into small pieces (1.5- 2 cm long or as desired). Now take a kadai and heat oil. Add mustard seeds. Once it starts to splutter, add curry leaves and the cut okra. Mix well and fry for 3-4 minutes on a medium heat. Mix well until all the okra pieces get a coating of the coconut masala. Then add little water just enough to cook the okras (nearly 1/3 cup). Then close it with a lid and allow to cook until the okra pieces are well cooked and most of the water has evaporated. Then turn off the heat. Benda Chakko is ready!! Serve it hot as a side dish to rice or rotis. Above measurement serves two people.